Are you searching for Tech Mahindra Off Campus 2018 drive? Here is the excellent news for those contenders. Tech Mahindra hiring fresher graduates and postgraduates across India through off campus and pool campus drives for multiple vacancies. If you are interested to appear for Tech Mahindra Off Campus Drive then you have to check the entire post. Those who meet the eligibility criteria will be called for interview. 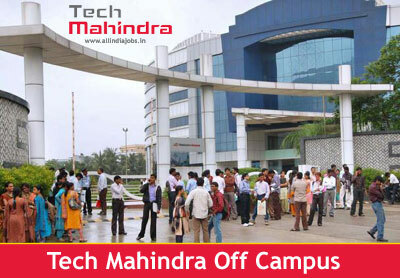 Qualified candidates can apply online for Tech Mahindra off campus drive through below provided registration link. Before going to apply for Tech Mahindra Campus drive, you must check eligibility criteria, salary details, selection process, job role, location etc. If contenders have any doubt about Tech Mahindra Off Campus Drive 2018 can contact us through the email. Job aspirants have to refer Tech Mahindra placement papers and Tech Mahindra Test Pattern to crack Tech Mahindra Online Tests. Before starting your preparation you should always check latest Tech Mahindra test pattern and syllabus. In this review, Tech Mahindra Recruitment information is provided here for the Fresher graduate and Post Graduate applicants. The officers of Tech Mahindra will conduct the exam so practice hard to get placed in. The competition is very tough. Getting a job in Tech Mahindra is a prestigious thing. Who will clear all the rounds, the company officials will provide the best pay scale, benefits, and incentives to the selected candidates. To view clear and full details about updates and job vacancies look after our website All India Jobs for latest freshers jobs in India which was very helpful for gaining any kind of jobs. Specialization: BE/ B.Tech – Automobile, Computer Science, Electrical, Electronics, Electronics & Communication, Electronics & Electricals, Electronics & Telecommunications, Information Science, Information Technology, Instrumentation, Mechanical, Mechatronics, Telecommunication). Candidate from a technical background is also eligible. Who are interested in working with Tech Mahindra shouldn’t have any pending backlogs. It is mandatory to each and every candidate to clear backlogs at the time of appearing for Tech Mahindra Off Campus Selection Process. Candidates will be required to go through Campus Test (Quantitative + Maths + English), Story Writing in English based on random Image, Tech Evaluation, HR Evaluation. Based on performance in the selection rounds contenders will filter for the further process. Tech Mahindra will provide salary based on their performance shown during the Tech Mahindra selection rounds. Selected candidates will get a pay scale according to their role which was offered in the market. Click on Apply Here which are given below. In this section, we are providing the suggestions to crack Tech Mahindra Off Campus Drive. Practice Tech Mahindra Placement Papers and Syllabus. Should be able to work in any shifts. Have a look on Tech Mahindra Test Pattern and refer it before going to interview. Be confident and perform well. Qualified and interested candidates can apply for Tech Mahindra Off Campus Drive as early as possible by the above provided link. We hope the Tech Mahindra Recruitment data is helpful for applicants. In this web page, candidates can get an essential information about jobs throughout India. If this job is irrelevant to your profile then have a glance on this page Latest Freshers Jobs. Which date the office campus will be held and where ? Did u get any reply from tech Mahindra?? really this site is a good way for job…. Sir, you have any vacancies for electronic and telecommunication diploma engineer.